Welcome back to the Create-A-Greeting-Card Scholarship Look Back Series. The 2007 winner, Elizabeth Digre, submitted a beautiful scene of a calm lake surrounded by snow covered trees with the sun glistening through them. It was such a beautiful scene and became a wonderful addition to our product line. In today’s entry, we wanted to take a chance to show off a couple of other beautiful snow covered tree scenes in our line of cards. Check them out below. 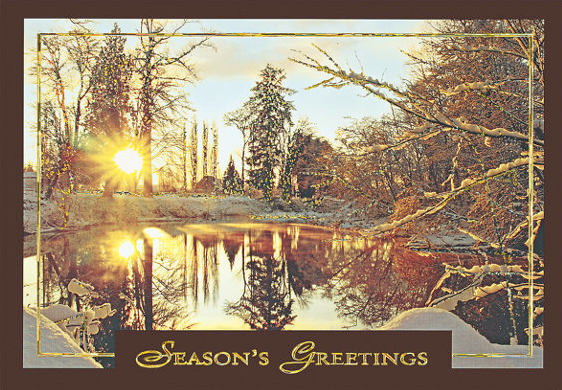 Card Description: The winter sun bids a glowing goodnight on the burnished gold landscape of a serene lake, framed by branches of snow-kissed trees. Card Description: Surrounded by a border of deep blue and reflective silver foil, this winter scene will bring peace to all with its sense of serenity. 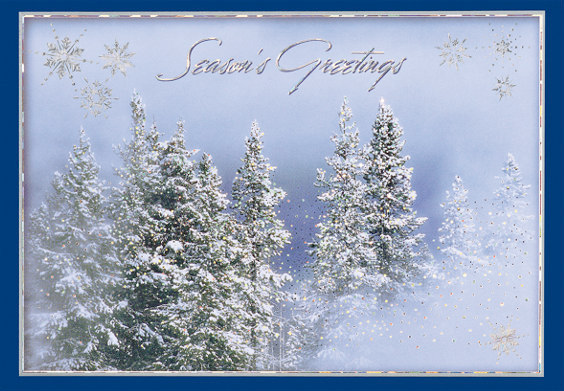 A soft white cloud of snow seems to open a window on a gathering of snow-crusted fir trees, silently greeting silver snowflakes as they float high above. This Season’s Greetings card will delight both the sender and recipient. 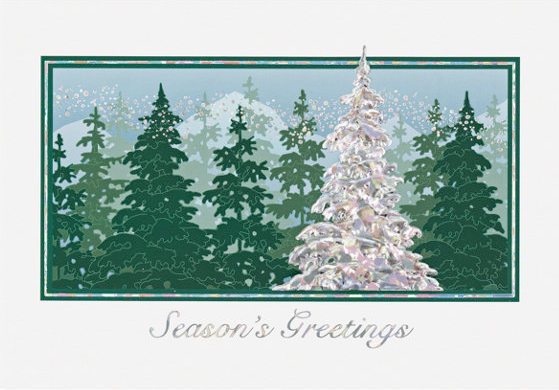 Card Description: Iridescent foil draws your eye to the splendor of the evergreens in winter. The muted mountaintops in the background stand as silent reminders of the snow yet to come. 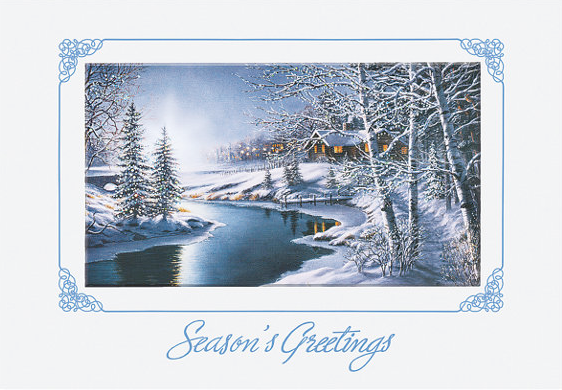 Card Description: This holiday card depicts the perfect winter scene. A glorious stream, with its banks of snow, leads into the secluded splendor of a cozy forest community. This lovely, inviting scene will bring warmth to your Season’s Greetings. Appropriate Christmas card wishes to send employees, business clients and friends. Elizabeth Digre’s remarkable design fit right in with the rest of our collection of holiday cards. It truly was an amazing entry and the perfect design to be chosen as the winner of our first ever Create-A-Greeting-Card scholarship contest. Cards submitted by students who entered The Gallery Collection’s Create-A-Greeting-Card scholarship contest are not only beautiful but are one of a kind making this a win-win competition.